In a bizarre homage to governments gone by, the UK Borders Agency has deported an Australian trades unionist back to the colonies. Her crime? Singing. If you’re heading to Tolpuddle next weekend for the annual union festival – a great mix of political debate, foot-tapping music and beer – spare a thought for Maureen Lum from Tasmania. The Australian trade unionist was due to take part in the annual rally to commemorate the Tolpuddle Martyrs, who were deported for forming a trade union – but has herself been deported. Maureen arrived in the UK last Sunday for a long planned holiday and was due to sing with the Grassroots community choir at the festival in Dorset. However, immigration officials at Stansted Airport deported her for not having a performers’ visa, despite the fact that she was not being paid to come or for her performance. The deportation has led some commentators to question whether grandmother trade unionists are more unwelcome than alleged terrorists. Nigel Costley, South West TUC Regional Secretary, said: “You would have thought that after 170 years things might have moved on. “The Tolpuddle Festival is more than a rally for trade union members; it is a celebration of working people’s culture. We were delighted when the Grassroots Union Choir agreed to come and perform. Just to remind you what the Tolpuddle Martyrs’ Festival is all about, in 1834 six Dorset farm workers were arrested and sentenced to seven years’ transportation for organising a trade union. Massive protests swept across the country and thousands of people marched through London; many more organised petitions and protest meetings to demand their freedom. Eventually they returned home in triumph. The festival takes places each July when thousands of people come to small Dorset village to celebrate trade unionism and to remember the sacrifice made by the six farm workers. It’s a popular mix of political discussion and speeches, great music and the traditional procession of banners, wreath laying and Methodist service. Ridiculous. Poor Maureen, how terrible. I hope she can make it for next year! 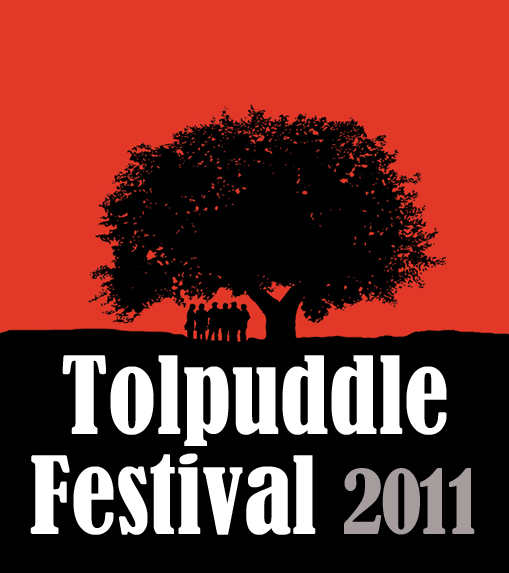 Wishing all at Tolpuddle a fantastic weekend of sun, music, fraternal cheer and celebration at this unique festival. It’s in the Guardian this year….